listen to music and enjoy the crowd. 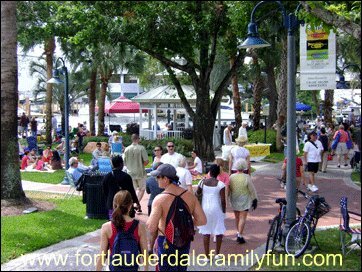 The Sunday Jazz Brunch is, I think, one of the best Sunday outings for families in the Fort Lauderdale area. Riverwalk, as a shopping and dining complex may have had its share of ups and downs over the years but with this event, the place is crowded with people – locals and out-of-towners alike. Babies, parents, children and teenagers. Couples and singles. Dogs, too! There is a great garden party atmosphere and wonderful live jazz music played by local artists. There are four stages where the bands play. You’ll be able to listen to different types of jazz simultaneously from Dixieland to bebop, fusion to Latin to funk. The best part about it is it’s free! Bring a cooler with your picnic brunch, a large blanket or folding chairs. Make sure you come early to get a prime spot by the New River. 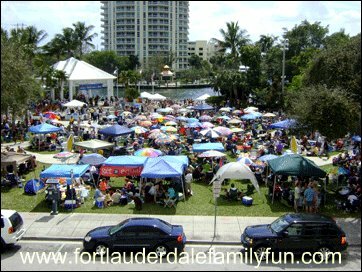 Lots of people flock to Riverwalk in downtown Fort Lauderdale once a month to enjoy this unique event. Bring folding chairs and blankets and pick the perfect spot for a picnic. You can choose a place not too far from the band that’s playing the jazz music you like best. 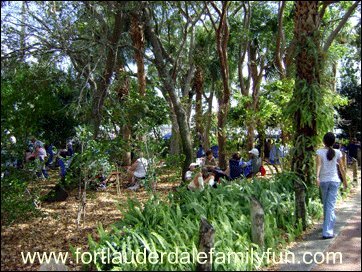 When the sun is too hot, you can try to find a place to sit on the shaded area just in front of the Museum of Discovery and Science, not too far from the Broward Center for the Performing Arts. Look at the crowd! This event is indeed very popular. There’s nothing like jazz rhythms played live to uplift your spirit and give you the right mindset for the month ahead. Here's a sample of some of the music you might hear played.